Well hello there! I’m so glad you’ve stopped by. It’s another week and another menu. I hope you all had a fabulous weekend! As you know last week here in Canada we celebrated Thanksgiving. I hosted dinner for 11 people and we had such a wonderful time. Dinner was an hour late because the darn turkey bird was taking it’s sweet time cooking but other than that small moment of panic it all came together nicely in the end. I tried a new vegetable recipe this year and was it ever good. Whenever I host a dinner I like to prepare as much of the dinner as possible in advance. I have a small oven and once you get the turkey in there you don’t get anything else. The day before I made up my stuffing, veggie casserole and dessert. The morning of the party I put my stuffing in the crockpot and baked both the vegetable casserole and homemade buns before putting the turkey in. The dough for the bun recipe is done in the bread machine and it is really wonderful. Later while we were carving up the turkey and right before we ate I just had to heat the two things up in the oven. Easy and absolutely delicious! Also in preparation for the US Thanksgiving I wanted to let you know about a great contest going on over a ilunchbox.com. They have teamed up with Spice Hunter to bring you all the spices you will need to create sensational holiday dinners and treats. A prize valued at $150.00! For more details on how to enter visit ilunchbox.com. beautiful place setting. I hear you on the lack of space once the turkey is in. My friend recently bought one of those plug in roasters. She LOVES it. It cooks in several hours and best of al the oven is free for side dishes. She got hers at superstore for $25. Initially she used it for camping but now uses it for all of her turkeys. have one on my christmas wish list. What a delicious and simple Thanksgiving meal! Glad you all enjoyed it! I had my menu plan scheduled for 10 pm est and wow…yours posted at the SAME time! Glad I checked after mine posted! Cool! Have a delicious week…that broccoli cheddar soup looks awesome! Your menu looks delicious. I can’t wait to try the recipe for the rolls. Oh! Thanksgiving! My favorite holiday of all. Only one more month to go here in the States. Those Golden Pan rolls love SO good! I’ll have to try the recipe. And I’m going to have to have broccoli cheddar soup – soon! Thanks for being here every week. Even if I stray for a while, I always get back on track, just so that I can post my menu with you! Your Crock-Pot Apple-Bacon Pork Chops with rice, zucchini and mushrooms looks great! Have a fantastic week! I hope you like the soup. I clicked on it because I was curious to see what recipe it was. I was suprised that it was mine. 🙂 I hope you enjoy it. 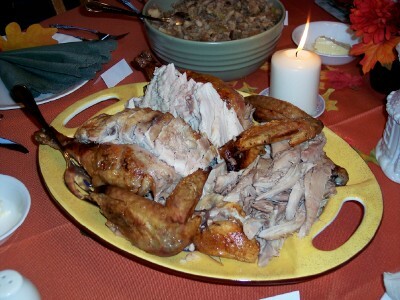 Mmmm…I can’t wait until Thanksgiving here in the states! Those little buns look so delicious. Sounds like the Thanksgiving dinner was a wonderful success. I am really excited for Thanksgiving this year for my family. 🙂 Your spread looks delicious (especially that casserole!). The broccoli cheddar soup looks yummy. Thanks for hosting! That soup and the pork chops sound delish!! Hey I didn’t even ask how your stuffing turned out…see you on Wednesday!!! It’s true, I neglected to mention I’ve never made stuffing before..is that weird? I was scared but I did it and it turned out great! Having a menu every Sunday night is helping so much and I’m getting great ideas from other menus on here! Thanks. wow, that acorn squash feta casserole looks amazing! Your food looks delicious – makes me wish we had Thanksgiving over here. But alas I have to wait until Christmas when it will be too hot to cook such a hearty dinner. WOW! I can’t believe you’ve got so many entries already! And I love the sound of the crockpot pork chop apple thing. I may modify that a little and try it next week with the pork chops in the freezer – yum! I love the crock pot apple bacon pork chop idea! Sounds YUMMY! I will be sure to try it! I spent many hours linking to menus and recipes last weekend. I got totally inspired. I plan to become a regular!!! Thanks for the inspiration! Sounds great! Hosting 11 people though sounds tiring! Well done! 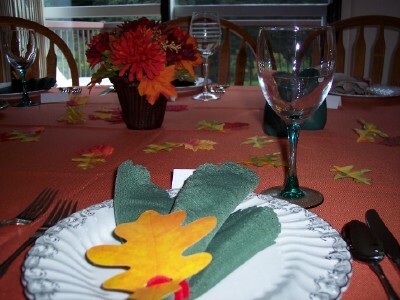 I am in the process of planning our table setting for Thanksgiving and always looking to do something different. What are the napkin rings made out of? Thanks for the beautiful pictures! 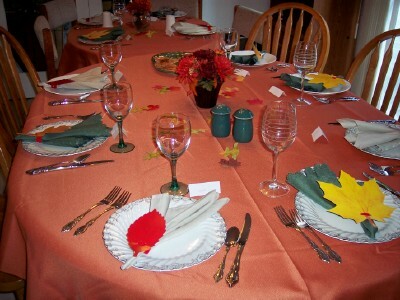 Your Thanksgiving table looked great and the food looked delicious! I’m glad it all worked out for you! Happy Thanksgiving! Looks like you had a terrific spread. Yep, adding those rolls to my recipe box….thanks for sharing. Also, I can’t BELIEVE how many people are on this now…..on Monday a.m., I used to be in the top 100 people….wow, now it is almost to 200 this a.m…..and that isn’t including the people who will post after me….wow…. SO many recipe’s so little time… I’ve found a ton of new recipes to add to my collection from you gals- THANKS!! Yay, my second one! Glad you had a happy Thanksgiving. I’m just get started thinking about ours (but need to get through Halloween first before I start planning in earnest)! I just posted my husbands birthday menu for his big 3 5 today! 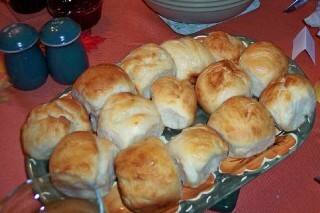 I just learned how to make drop biscuits the other day, but those honey pan rolls looks so good! hey! Hope you had a happy thanksgiving, we went for Ukrainian sausage and ham with potatoes instead of traditional turkey! Great menu ideas! and what a neat meme. My first time trying it out! I love your Thanksgiving photos. Using a crockpot is definitely the way to go when your oven is full. I’ve never tried using one for stuffing, but I see it mentioned a lot during the holidays. I will have to give it a try and see how I like it. Thanksgiving dinner looks so yummy and pretty! Wow, looks like you had a fantastic day! 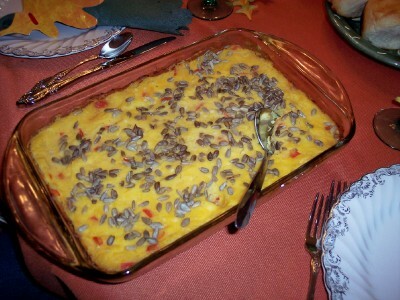 I think I need to try that squash casserole! I’m glad your Thanksgiving went well, even with the slight delay. And thank you for the Chocolate-Peanut Butter cake idea. I’m sorry that I didn’t get back to you earlier – life has been a bit stressful. 🙁 Anyway, since I decided to re-join Weight Watchers this week – I think I’ll go with some biscotti – a bit easier for me to enjoy in moderation. 😉 That recipe has been in my To Try file for when I have some friends over that LOVE chocolate and peanut butter though! That turkey looks fantastic! I might just have to switch my Saturday meal for a Turkey this coming weekend. Your Thanksgiving meal looks divine! And I am most definitely trying those honey pan rolls! My mouth is watering just thinking about them! Happy Thanksgiving! I am going to borrow the Acorn Squash recipe for our Thanksgiving. It looks really interesting. Looks great! I have my menu’s posted as well, including WW points! I love Panera’s Broccoli Cheddar Soup, so I’m absolutely going to have to try that one! Yum! Your set table looks gorgeous! I’ve followed your blog for so long now. I’m happy to report that I’ve learned better organization skills by using unique items! I’m loving my menus, too. I’ve tagged you over at one of my blogs, if you’d like to play along. Looks like you had a fabulous spread there for Thanksgiving. The place settings are pretty. Have a great week! i’m new here. 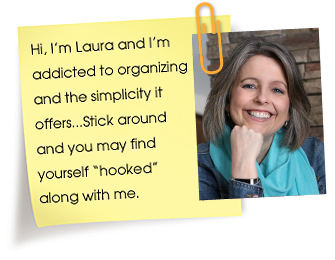 Your site looks great, full of wonderful tips and tricks! Hi, I’m new to Menu Plan Monday. I hope I did this correctly. We’ve been going to the grocery store every other week, so I plan for 2 weeks at a time. It saves time and money running across town to buy odd and end grocery items. I forgot to leave my link yesterday! I am enjoying perusing the menus each Monday. The Golden Honey Pan Rolls look tasty! I bookmarked the recipe and hope to try them soon. Thanks for sharing! I’m a day late adding my link, but my menu is up! I’m trying out some new recipes using whole grains this week. I am sooooo loving this! We SHOULD have celebrated Canadian Thanksgiving since my husband is Canadian. We usually make tourtière. Your meal looked fabulous!! Love the Meal Plan Monday idea! Support organisations and the United Nations have appealed to the international community for support. The response has been overpowering, and planes are staying turned away from Toussaint L’Ouverture Worldwide Airport. your site is very interesting. thanks for sharing! You may have already been pressured out lately? Are you require New Wedding mementos tips? Should you choose to, I recommend you this website that tells you about marriage. After visiting, understand a total deal more! Hiya, I am really glad I’ve found this information. Today bloggers publish just about gossips and net and this is actually irritating. A good web site with interesting content, that is what I need. Thanks for keeping this web site, I will be visiting it. Do you do newsletters? Can not find it.